This issue of Healthcare Quarterly features the third and final instalment in a three-part series developed by Ontario's The Change Foundation featuring international perspectives on health service delivery models that improve system integration and ensure seamless services and better coordination. Part one featured Chris Ham, chief executive of the London-based King's Fund think tank, and part two featured Geoff Huggins, director for health and social care integration in Scotland. In this issue, Helen Bevan, chief transformation officer of England's National Health Service, discusses the radical shifts she'd like to see in how we approach integration. There is increasing agreement that integrating health and social services is an essential step in improving the health of citizens and the sustainability of healthcare. But Helen Bevan, the chief transformation officer of England's National Health Service (NHS), wants to see some radical shifts in how we approach that change. Bevan believes system change will not happen unless we take the emphasis off hierarchical power to focus primarily on collaborative teams that are unrestrained by corporate boundaries, freed from the constraints of permission and trained and enabled to respond to the needs that empowered patients to define for themselves. Her remarkable vision is being brought to reality in England, as Bevan explained to a group of health leaders from across Ontario at the Change Foundation's Toronto office in early 2018. Bevan was the third health leader from the UK to speak on innovative approaches to integrating care as part of a series organized by the Change Foundation with partners from the University of Toronto – the Institute of Health Policy Management and Evaluation, the Health System Performance Research Network and the Dalla Lana School of Public Health. Recent reforms at the NHS are part of an ongoing and long-standing movement towards integrated care that goes back to Margaret Thatcher's time as prime minister, and which Bevan has been involved in for 25 years. After all those years of re-invention, and in the face of crushing demand (the NHS sees a million patients every 36 hours), healthcare providers did not precisely welcome the news of plans to restructure again, Bevan told the audience in Toronto. But there was no choice, she said. "When we looked at the trajectory of demand and we know what's happening to cost and we look at the numbers of people who experienced poor care in our system, we see that we have to change things." It has been clear for some time that simply working our current hospital-based model of care harder to meet rising demand is not the answer. Rather, the NHS needs to work differently by providing more care in people's homes and the community and breaking down barriers between services … The NHS also needs to give greater priority to the prevention of ill health by working with local authorities and other agencies to tackle the wider determinants of health and well-being (Ham 2018). Bevan began with a cautionary tale about the importance of labels. Because the plans for transforming the delivery system were being developed, groups of providers (comprising hospitals, community health, mental health and primary care) who came together to offer care were named "accountable care organizations." Because the term was first used in connection with American healthcare, it was an immediate red flag; its definition, which called for "competitive procurement" from organizations capable of delivering care, was interpreted as a sign that the National Health System was moving towards privatization. In fact, no one expected the private sector to be able to deliver the services the NHS was looking for; but that message got lost. The Health and Social Care Committee of the British House of Commons noted in a report released in June 2018 that the similar name had caused confusion and fear of privatization but said there was no evidence that ACOs were intended to dismantle the fundamental principle that the NHS is free at the point of delivery (House of Commons Health and Social Care Committee 2018: p. 7). The committee also stated that it supported the move towards more integrated and collaborative care, but commented that "… understanding of these changes has been hampered by poor communication and confusing acronym spaghetti of changing titles and terminology, poorly understood even by those working within the system. This has fuelled a climate of suspicion about the underlying purpose of the proposals and missed opportunities to build goodwill for the co-design of local systems that work more effectively in the best interests of those who depend on services," (House of Commons Health and Social Care Committee 2018: p. 6). The provider groups have since been renamed integrated care organizations. Bevan's lesson, however, went beyond just the need to choose words carefully. It is not possible, she said, to create large-scale change if you do not find the language and labels that are meaningful to people. "If we want people to take action and get involved, we have to connect with emotions through values. The labels, the framing we use must connect right back to the purpose of what we're doing – it's got to be about great patient care, it's got to be about quality. It's got to be about doing things that are right and meaningful." Old power works like a currency. It is held by few. Once gained, it is jealously guarded, and the powerful have a substantial store of it to spend. It is closed, inaccessible and leader-driven. It downloads, and it captures. New power operates differently, like a current. It is made by many. It is open, participatory and peer-driven. It uploads, and it distributes. Like water or electricity, it's most forceful when it surges. The goal with new power is not to hoard it but to channel it. Old power, Bevan said, is transactional and commands action. Change, such as shortening waits in emergency or meeting a ministry performance target, is ordained from those higher in power. But old power ends at the door of a healthcare organization. It does not work well with patients and families or the community sector, and it is not suited to integrating with other organizations. For that purpose, you need new power, which is based on relationships and trust. In new power, people come together with common goals, and the more people who are engaged, the better. "When I engage in a new-power way, when I mobilize to be part of change, I do it because I want to do it, because it fits with who I am in the world and my values. And I contrast that with old power, which says we have to do it because it's the target or it's part of the inspection system." 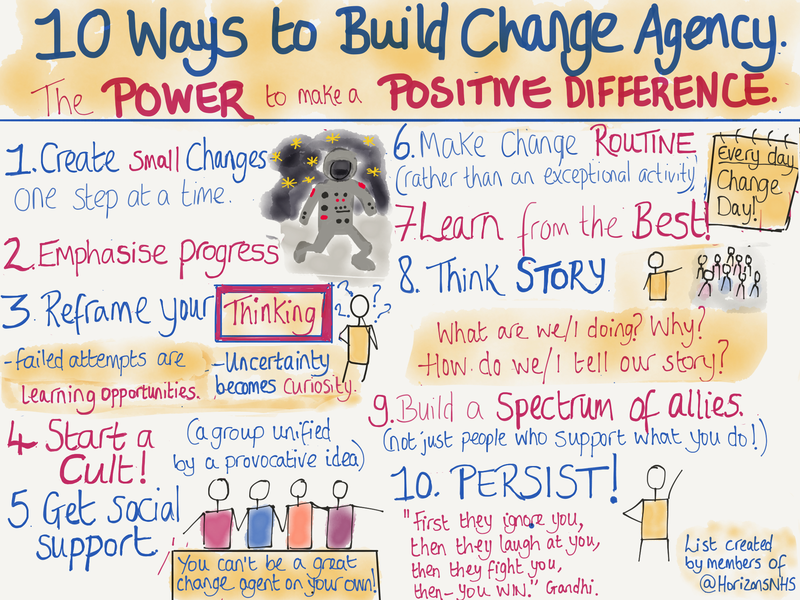 Health leaders who gathered for the Change Foundation sessions were encouraged to ask questions; one of the first posed to Bevan was whether it is possible to teach old dogs new tricks – that is, to shift leaders from working in old power modes to new. Bevan admitted that telling leaders to stop competing – a model that has dominated the NHS since the early 1990s – is a tall order, and to accomplish it, they have made a "massive" investment in coaching leaders on collaborating. But, in answer to another question, she said that old power will never disappear completely. "I don't know a single system that hasn't got some formal hierarchy in it and it's a good thing. We need to work in different ways." Top-down management that sets standards for care, measures results and implements improvement is essential for quality control, she pointed out. However, she has some concern that the younger generation of leaders is still being inculcated with old power values; she is hoping the steady increase of collective approaches, and sharing and trusting relationships will come to naturally dominate. "One thing about leaders in the NHS is that they're very good at adapting – any system that is restructured as often as ours, you have to be confident that it's going to change." Trust is the key to successful leadership – of either kind, Bevan emphasized, although absolutely essential in the relational model of new power. Change happens at the speed of trust, she said (and added that, according to a Dutch proverb, "trust comes in like a tortoise and goes out like a horse," that is not very fast). The way to win trust is to operate in ways other people perceive as trustworthy – which is to do what you say you will and follow up on it, listen to people and respond and make sure your own behaviour and what you are calling for align. Many leaders, Bevan said, do not grasp that they are always generating signals. "What we do, what we say, is massively amplified, far more than we realize. If we keep having conversations about hitting targets and inspections and levels of activity, our colleagues are going to think that's all that matters to us … So having conversations about the bigger purpose and what really matters to patients and what we're excited about is really important." It all takes a lot of time, Bevan said, but added, "In an era of integrated care, I don't think there's any magic bullets or short cuts or quick ways of doing it." One participant at the meeting asked about what approaches were being used to involve primary care in the new health entities. Bevan described a substantial change in the past five years, from a time when general practitioners (GPs) were rarely involved in leadership development to now when primary care is central to the new care models. "You can't do this to primary care, you have to be doing this with primary care," she said. Later, Bevan's colleague Stephanie Cartwright gave some details on how Dudley CCG has involved GPs in its shift to becoming an integrated care organization. Over the years, she said, she has learned that primary care physicians tend not to be interested in change unless they can have a fundamental part in leading it, and that is what they are being offered now. In response to a further question, Cartwright offered advice on building capacity for leadership. Her advice was to keep things simple, start work with a group of people who are committed and enthusiastic and get to work right away in breaking down traditional divisions between organizations, as Dudley did by instituting "teams without walls." This created a core group of potential leaders employed by different organizations but freed from the barriers that prevented them from working together to build better care. "We had created a situation where we made it impossible for our professional staff to do the right thing for the right person at the right time, because we put too much red tape, too much bureaucracy, too many rules around it to make it possible." That freedom has enabled them to grow into new power leaders, she said. Enabling people to make change is the heart of Bevan's third lesson, on whether to focus on changing the structure or creating change agents when attempting large-scale change. It is an ongoing question for social science, Bevan said, whether redoing structures (the rules, mechanisms and incentives that create a system) or focusing on agency (giving people the freedom to act for change) is a better approach to reforming organizations. Over the past 20 years, public-sector reform has focused on structural mechanisms, but that is problematic because changing structures is complex and quickly becomes overwhelming. It also does not usually involve a broad base of stakeholders and therefore has less chance of lasting success. For all those reasons, the focus on many fronts is shifting to change agency, which Bevan defines as "the power individually and collectively to make a positive difference." Working to build agency pushes boundaries and mobilizes people who likely would have been excluded from structural change and generally produces results more quickly. That is not to say it is fast or easy, Bevan warned, because building connections with people is time-consuming. "It takes 10 times as long at the beginning, and you think sometimes you haven't got time to do all this engaging and investigating and talking things through with people, but I've learned time and again that if we invest this way at the beginning and have a clear narrative and people feel it connects with their values, it creates foundations that are much stronger." Bevan's team recently surveyed all NHS employees in England, and the most common feedback they got back was that the permission culture – the hierarchy of approvals required before any action can be taken – got in the way of front-line workers acting to improve care and conditions where they worked. One way to counter that is by training people at the NHS School for Change Agents started by Bevan and her colleagues. It is a virtual school, attended by employees from sustainability and transformation partnerships around England. Together, they develop the skills, confidence and relationships they need to act as change agents. At the same time, Bevan said, organizations have to be open to working with change agents. The first step is to get beyond talking to the same small groups of leaders and experts because, according to Bevan, research has shown that diverse groups of people consistently make better decisions than small groups of experts. Other steps include opening up decision-making, having different conversations with different people and creating an environment where new ideas have a chance. "We don't necessarily need lots of experts coming and telling us what to do while we're sitting and listening passively. We need to create space where people can come together to solve their own problems." Cartwright's experience has been that if you create the environment for people to do the right thing, they will naturally make it happen themselves. She quoted an academic she once heard urging employers to have more trust in their people to do the right thing, "because there aren't really that many idiots around." The two speakers offered several lessons beyond Bevan's three main points. Cartwright, whose system transformation partnership has been working towards integrated care for five years, cautioned that change can be difficult for people and they will often need help to accept it – so it is important to work at the pace of the people you are bringing along. "Remember this is a journey and not everyone will be there on the same day," she said. Bevan agreed, saying leaders need to understand what individuals' and groups' interests are, and what resources they need to be part of the move to integrated care. "We need to try and work out how we can create a win-win situation for everyone because there can't be winners and losers in this, it has got to get to yes." She made a related point, in answer to a question about the extent to which Ontario should try to emulate the NHS approach to integrated care in the absence of rigorous proof of success. Research and development and applying implementation science are all important, Bevan said, noting that there are clearly processes and methods that work and are replicable, and understanding what works and what makes the biggest difference are all important. At the same time, she cautioned that it is essential to consider the local context for change. "When it comes to replicability and being able to do things in different ways, the extent to which we create fertile ground for change is probably more important. So, when I talk to you about the kind of investments that have made in team coaching to create leaders, where we've created leadership behaviour that is about innovating and doing things differently, that is really important and it makes a difference." Integrated care is being introduced in stages, and few places are as far along as Dudley, so empirical evidence of success is limited, but there is some, according to the King's Fund article by Ham (2018). Two of the new models of care, primary and acute care systems and multispecialty community providers, have seen lower growth in per capita emergency admissions than the rest of England and some new care models have seen absolute reductions in emergency admissions. One of the integrated care systems has seen fewer GP referrals and no increase in accident and emergency admissions. Same-day GP access for patients with urgent problems has been improved in some areas, and community services have been aligned more closely with GP practices and adult social care in others. Other improvements include better coordination between long-term care, GPs and community services (Ham 2018). Cartwright told the meeting that it is clear that Dudley's integration efforts are succeeding in ways that will satisfy the finance people – fewer visits to emergency, fewer emergency call outs and the like, but to her, success is the difference it is making in people's lives. "Is it going to save the NHS millions and millions? Possibly not, but what it will do is mean that the money is spent in the right place." Cartwright offered a final lesson to the group. "We've spoken to the patients and the public about this, I've had more people say ‘So this isn't what happens? This isn't what we do?’ When I introduce the model of care, I don't come across people who say ‘Oh my gosh, you should do this,’ I come across people who say ‘I can't believe this doesn't happen already.'" Cathy Fooks is the president and CEO of The Change Foundation. Based in Toronto, the Foundation is dedicated to improving patient and caregiver experiences in Ontario's healthcare system. Jodeme Goldhar is the executive lead, Strategy and Innovation, at The Change Foundation; adjunct faculty at the University of Toronto, Institute for Health Policy, Management and Evaluation; senior associate for The International Foundation for Integrated Care (IFIC); and a fellow of the NHS Horizon team. Jodeme's focus is to advance the exchange of knowledge, information and practice to improve the experience between patients, caregivers, health service providers, policy makers, funders and researchers to drive integrated systems of care. Walter P. Wodchis, PhD, is a professor at the Institute of Health Policy, Management and Evaluation at the University of Toronto and research chair in Implementation and Evaluation Science at the Institute for Better Health, Trillium Health Partners. His main research interests are health economics and financing and healthcare policy evaluation. Dr. Wodchis has led several studies examining the complex needs of high-cost patient groups, the implementation of integrated care programs to address those needs and evaluations for a number of integrated care programs in Ontario. G. Ross Baker, PhD, is a professor at the Institute of Health Policy, Management and Evaluation, the University of Toronto and program lead in Quality Improvement and Patient Safety. Ross is also the co-lead for IDEAS (Improving and Driving Excellence Across Sectors), a large quality improvement training program in Ontario. Ross' recent research projects include an edited book of case studies on patient engagement strategies, a demonstration project that assesses an innovative approach to monitoring and measuring patient safety, and studies of the implementation, scale and spread of integrated care initiatives. Jane Coutts is an Ottawa-based writer and editor specializing in healthcare issues. She is a former journalist and has also worked on knowledge transfer at the Canadian Health Services Research Foundation. Ham, C. 2018. Making Sense of Integrated Care Systems, Integrated Care Partnerships and Accountable Care Organizations in the NHS in England. London, UK: The King's Fund. Retrieved January 30, 2019. <https://www.kingsfund.org.uk/publications/making-sense-integrated-care-systems>. Heimans, J. and H. Timms. 2014. "Understanding ‘New Power.'" Harvard Business Review. Retrieved January 30, 2019. <https://hbr.org/2014/12/understanding-new-power>. House of Commons Health and Social Care Committee. 2018. Integrated Care: Organizations, Partnerships and Systems Seventh Report of Session 2017–2019. Retrieved January 30, 2019. <https://publications.parliament.uk/pa/cm201719/cmselect/cmhealth/650/650.pdf>. 1. Clinical Commissioning Groups were created following the Health and Social Care Act in 2012 and replaced Primary Care Trusts on April 1, 2013. They are clinically led statutory NHS bodies responsible for the planning and commissioning of healthcare services for their local area.